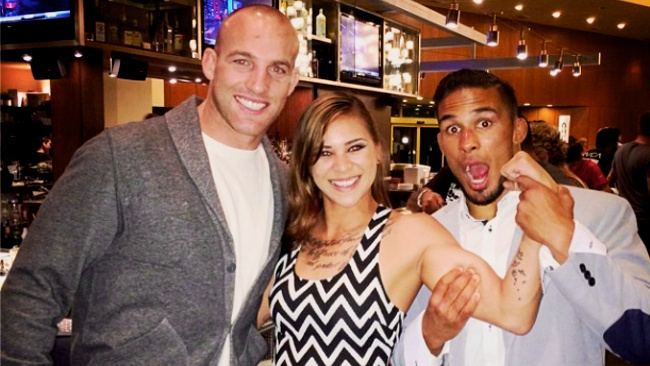 Photos via Kailin Curran's Facebook. Hawaiian’s have already made their mark on the sport of mixed martial arts. Per capita, it seems as though the small island chain has bred more elite level fighters than any other state—especially in the early days. Besides the fact that islanders are scrappy in general, there’s good reason for this apparent concentration of MMA. In 1988, Helio Gracie’s second eldest son, Relson Gracie, moved to Oahu and created scores of great fighters before the first UFC. Since then the scene has grown, and guys like Enson Inoue, BJ Penn, and Travis Browne have all put Hawaii on the MMA map. Well, for the men at least. Until now, no female representative of the Aloha State has ever stepped into the Octagon. This week, Kailin Curran became the first woman from Hawaii to sign with the UFC—setting her up to be the first. Kailin is primarily a kickboxer, and has won her first three professional bouts by decision. She may not be as fearsome and experienced as some of the other new strawweights, or the recent bantamweight acquisitions like Holly Holm or Rin Nakai, but she still has time to develop her game. Like most Hawaiian UFC fighters, she’s ventured off the rock to seek out better training, and is now working out of Reign MMA academy in Lake Forest, California. There are already 23 other fighters in her division, most of whom are currently filming The Ultimate Fighter. Her next opponent, Paige VanZant, tried out for the all-female, all-strawweight season, but was taken off the show's roster when the UFC found out that she was only 20 years old. It all worked out in the end, though, and the two will face off in Canada later this year at UFC Fight Night 54 in Halifax, Nova Scotia. It will take Kailin a considerable amount time to climb the ranks of what is now one of the most competitive divisions in the UFC. Still, regardless of how her debut fight turns out, she will mark the final step in Hawaii’s presence in modern mixed martial arts.